We went to my Nanny's 81st birthday party on Sunday (as well as Ross's 25th birthday party - must be kinda crappy to have the same birthday as your grandmother, and then have all the family together to not celebrate only you...) in London. It takes us 4 hours each way on the trains to have a 3 hour lunch with everyone. And it is totally worth it. Elizabeth has a fantastic time playing with her aunts & uncles & cousins, and Matthew & I have enough people around to entertain her so we can actually enjoy our meals! I had brought more than enough toys for Eliz to play with on the trains - evidenced by the fact that we actually read the free newspaper that came with the bottle of water we bought at Cambridge station! Miracle! I don't think that has ever happened before! And let me tell you, the world is kind of falling apart, guys. The weather is screwed up, the financial scene is pretty frightening over here in Europe, and no one seems to be happy with the decisions of any other country. But I digress: toys. Elizabeth was pretty much surrounded by good, small, quiet toys, but of course, wanted to play with the hair elastic I had around my wrist. No worries, I gave it to her, and earned another 10 minutes of quiet reading time. Then on the train to Abbey Wood, Matthew was feeding her cheerios out of a tupperware, and all of a sudden her leg just kicked right up into his arm, and splash! 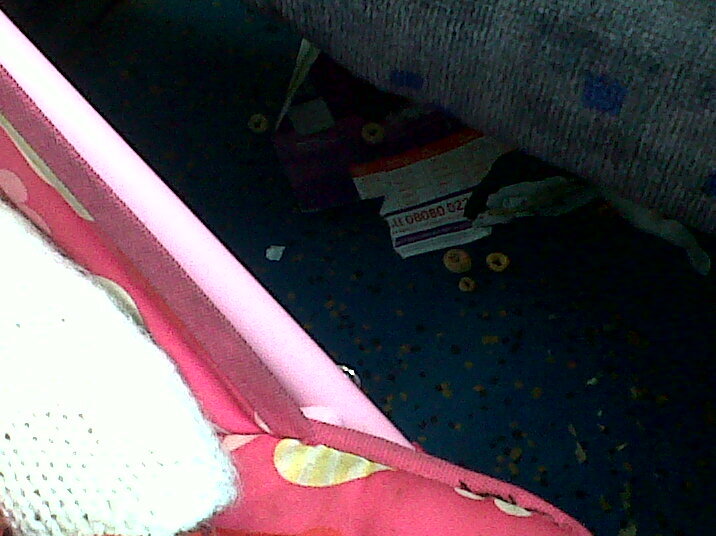 Cheerios all over our little berth. Great. I picked up most of them - just not the ones directly under my seat because I was wearing a dress (with my Tammy Taylors, no less!) and didn't want to flash the whole carriage. And also because there was a bunch of garbage underneath the seat and I didn't want to get gross, dirty, train garbage on my hands. So we had a great lunch, a good laugh with the family, and then headed home. As we were walking back to Abbey Wood station, I realized Eliz had left my hair elastic on the first train from Cambs. Then we started talking about how weird it would be to get on the train to Cambs, and be on the same train as the one we came in on, and the same carriage and the same berth, to find my elastic. We laughed it off - there are a billion trains, that is never going to happen!